Buy the right vacuum cleaner for the job at Carters, Brighton. At Carters Domestic Appliances, we stock all types of vacuum cleaners; so, if you are in the market for a cylinder, upright, or even a robotic vacuum cleaner, we can help. You will find that we offer most models from the well known leading brands such as Miele, Sebo, Dyson, Hoover and Irobot. Most types are available in different sizes, can be bagged or bagless, be eco-friendly, or extra powerful. These cleaners use a variety of filters from hospital grade materials and carbon to eliminate odours, to the very simple, traditional types. Some have retractable mains leads whilst others, like the Bosch Athlet, are battery powered - yet are capable of cleaning the whole home floor space in one sweep. The 18V lithium powered, 2 in 1 stick cleaner from Bosch, is an example of this type of vacuum appliance. At under £190, and weighing just 2.1kg, this cordless dark knight is no light weight, however, when it comes to cleaning. Fully charged, it provides forty minutes runtime to make light work of dusty hard floors and bitty carpets. It also comes with a two-year warranty. Functional simplicity armoured in black, or tornado red and white, it's credentials are as efficient and reliable as you'd expect them to be. 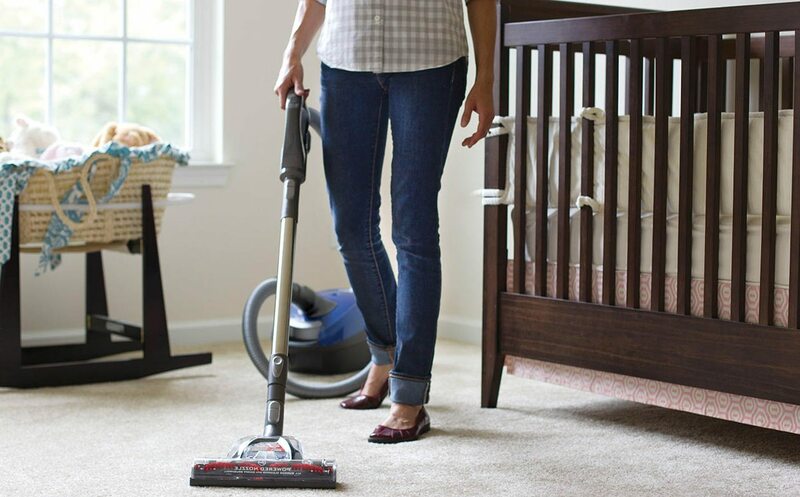 The Hoover brand has been long since been synonymous with cleaning carpets. It goes without saying that we have a selection of models from this favourite amongst household names for you to choose from, including easy to manage hand-held cleaners. Attractively priced at under £30, the Hoover VPA0310 steam gun is ideal for those small cleaning jobs around the home or in the car. It comes with numerous cleaning tools for upholstery and difficult to reach areas such as corners on stairs, crevices, and between fixed seat cushions. Upright carpet cleaners are amongst the most popular type of domestic vacuum machines, but what sets this traditional style cleaner apart from a cylinder type? The main difference is that the former needs a bag in which to collect debris and dust, whilst the latter simply draws it into a cylinder. Hoover bags need to be replaced regularly and the cylinder needs only to be emptied when full. By and large, there is no loss of suction with a bagless vacuum cleaner, making them more efficient at collecting dirt, and pet hairs, etc. Dyson, Panasonic and Sebo are just some of the manufactures of bagless cleaners and each come with features and technologies unique to their brands. Ball and Root, turbine heads, and freestyle nozzles give you not only manoeuvrability; both bagged and cylinder upright cleaners are becoming more lightweight, have tighter turning spaces, and clean right up to the edge of carpets and laminate, or tiled floors. All of which make cleaning less stressful and hugely more efficient. The ability of a powered cleaner to take on wet + dry cleaning jobs can be a blessing for many reasons. Just ask George. He's a numatic all-in-one vac who will dry, or wet vacuum, scrub, and dry hard floors, carpets and upholstery in a cleaning range of up to 26.8m. George is powered by 1200W two stage motor and comprehensive KitA26A, which produces 2500mm of suction and an extraction capacity of 6 litres. He'll never break out into a sweat, and he'll even do it with a smile on his face. Vax upright cleaners, in their signature orange uniform offer similar functions. Consider the lightweight upright 500w model for effortless wet + dry cleaning at under £70, delivered to your door (free of charge) within 24hrs. That's enough to put a smile on anyone's face! Banish the drudgery, and take the hassle of cleaning kitchen and bathroom floors, carpets and upholstery. Call in at our superstore in Brighton for the widest range of domestic appliances on the market, or visit our other shops in the Sussex area and ask our friendly team of staff to demonstrate a selection of vacuum cleaners to help you decide which is the best cleaner for your needs. Alternatively, browse our website and discover your dream cleaning machine from our comprehensive, value for money selection of vacuum cleaners. You might even pick up a seasonal bargain!